Now postponed to 11 October 2013.. 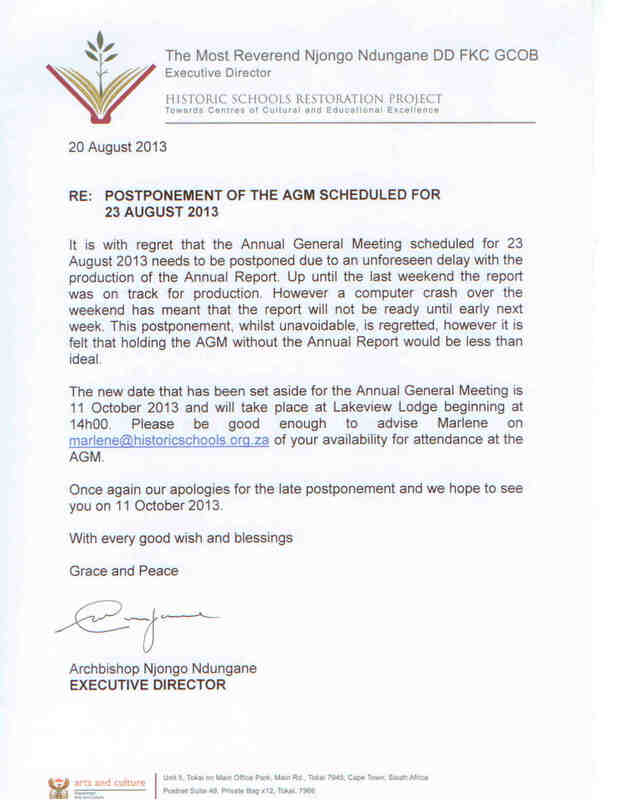 It is with regret that the Annual General Meeting scheduled for 23 August 2013 needs to be postponed due to an unforeseen delay with the production of the Annual Report. Up until the last weekend the report was on track for production. However a computer crash over the weekend has meant that the report will not be ready until early next week. This postponement, whilst unavoidable, is regretted, however it is felt that holding the AGM without the Annual Report would be less than ideal. The new date that has been set aside for the Annual General Meeting is 11 October 2013 and will take place at Lakeview Lodge beginning at 14h00. Once again our apologies for the late postponement and we hope to see you on 11 October 2013.